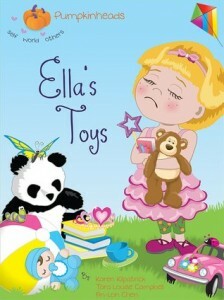 Ella’s toys are beyond compare, but playtime’s more fun when she learns to share! Flaunting her toys but keeping them to herself is not much fun after the other kids lose interest. Left alone, Ella decides to make it up to her friends. Children will learn an important lesson in this endearing book about sharing, friendship, and generosity. This is a cute book that helps children learn that sharing is not only the right thing to do but that it will also help you meet new friends. The cover is adoarable as are all the illustrations. The story is told in rhyme and is fun to read.